As a Director or Coordinator, you’re well aware that regardless of the quality and breadth of your CME programming, an inadequately prepared application—one that’s missing critical data or provides an incomplete narrative— can severely damage your chances at winning ACCME accreditation. It’s important to intimately know the latest criteria for accreditation. There are dozens of criterion for receiving ACCME accreditation. Many are mandatory for all applicants, and some only apply to associations seeking Accreditation with Commendation. All require an expert knowledge of data collection, curricular design, and learning analytics. Finding which criterion applies to your unique situation can be a significant challenge. 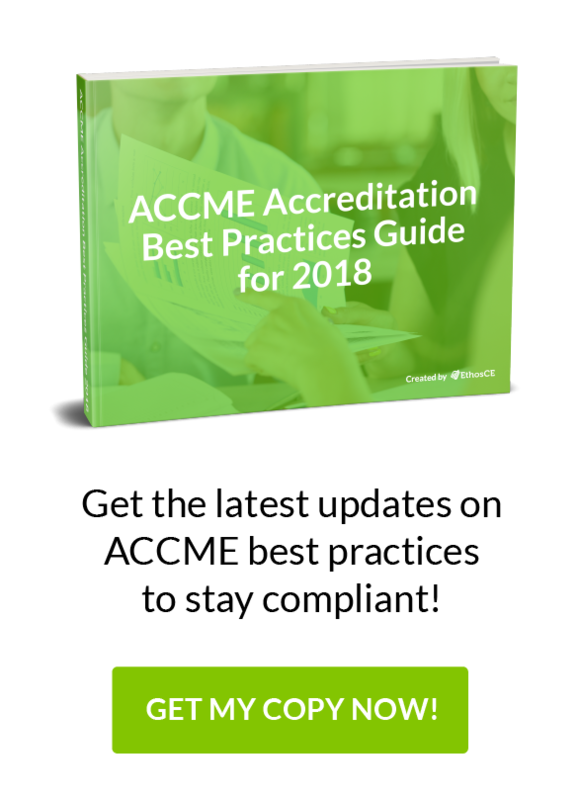 Fortunately, recent updates to ACCME guidelines have focused on clarifying accreditation applicant responsibilities and simplifying the language that details how CEs can achieve alignment with AMA and ACCME core principles. That said, ACCME guidelines aren’t exactly an effortless read. We’ve compiled a summary of the criteria for ACCME accreditation along with a list of what you need to know to create a successful application. Demonstrating compliance is as much about showing an enduring commitment to ACCME principles as it is giving evidence of program alignment with explicit regulations. Throughout the application process, you’ll be asked to answer hard questions about your program’s capacity to meet the needs of learners with varying levels of professional competence and diverse learning styles. You’ll have to provide details on your program’s curricular depth, its flexibility in response to new best practices guidelines, and your methods of self-evaluation, along with how you’ll find the data for your analysis. Provide a comprehensive mission statement. Your mission statement should present a detailed account of the specific improvements in your learners’ competencies and performance-in-practice that you hope to achieve, along with projected patient outcomes. Those projections should be based on a comprehensive analysis of the professional practice gaps experienced by your learners and a thorough assessment of how your program will meet their educational needs. Offer programming that optimizes educational resources to provide a superior educational experience. Your CME curriculum should be designed to maximize the value of the setting and structure of activities to develop a specific set of learner competencies and corresponding patient outcomes. Providers should also be able to give statistical evidence of their success in meeting those objectives across all programming. When those goals are not met consistently, the CE must present evidence of a “quality control” process that identifies and eliminates ineffective programming. Maintain strict boundaries between commercial interests and educational offerings. Commercial sponsors should have no influence on the curriculum offered or in its development. The CME program should have a process in place to find and correct potential conflicts of financial interest among administrative staff, instructors, or other curriculum providers. The ACCME Self Study is more of a wide-ranging confessional than traditional report, revealing virtually every element of your CME programming in unfiltered (and sometimes excruciating) statistical detail. Despite its exacting nature—and the significant weight that the ACCME places on the results—the Self Study process shouldn’t be approached with dread. Focus on evidence-based projections and assessments of your program’s impact on your learners’ professional practices. The ACCME isn’t expecting a flawless execution of your mission statement’s goals or an elaborate justification for a missed benchmark. Instead, present an honest evaluation of program strengths and weaknesses, along with evidence of your program’s ability to quickly realign with ACCME guidelines after a misstep. Provide a brief history of the origins and development of your CME program. Create a chart detailing the structure of your CME program’s leadership and operations. Provide a mission statement which includes expected programming results, including projected impact on learner competencies and patient outcomes. Explain how your organization identifies the practice gaps among your learners and the process through which you developed your curriculum to respond to their educational needs. Describe how your CME program is designed to achieve your projected outcomes by optimizing knowledge retention and learner engagement across various educational settings. Show how specific aspects of your programming are structured to amplify desirable physician attributes. If you want to understand demonstrable learning outcomes—one of the key criterion for your self-study—you only have one word to memorize: data. Your narrative and mission statement is meaningless without it, and your application won’t stand a chance if you can’t provide real-life examples of how well your association’s approach to CME works. While the independent surveyor visit may be as welcome as an IRS audit, you’ll have much less to fear—even if you’ve occasionally missed the mark during the development of your CME program. Be prepared to explain your curriculum development process and quality-control methods in detail. Look for gaps in your narrative where you lack anecdotal support for your claims of positive results and add missing data where you can. While the surveyors won’t give you specific recommendations, their questions will give you an idea of your application’s strong points, as well as the areas where you’ll need to shine during your interview (and give hard evidence of how your association handles less-than-optimal results). This is your last chance to make your case, but you won’t be able to fix a poorly prepared application at this juncture, regardless of the strength of your presentation. The interview will be wide-ranging and detailed, but never adversarial. You’ll need to give life to your narrative by offering a compelling argument for your association’s right to represent ACCME principles as an accredited provider. Winning the interview isn’t matter of oratory skill, it’s completely dependent on preparation. Managing data, submissions, and understanding accreditation guidelines without export support is a challenge that’s too important to face alone. At Ethos CE we’ve worked with medical associations and health systems for more than 16 years, helping them to successfully navigate the accreditation process. You can click here now to request a time to speak 1-on-1 with our CME technology experts to explore new ways you can simplify your ACCME accreditation submission process!